Is Firefox loading web pages too slowly for you? 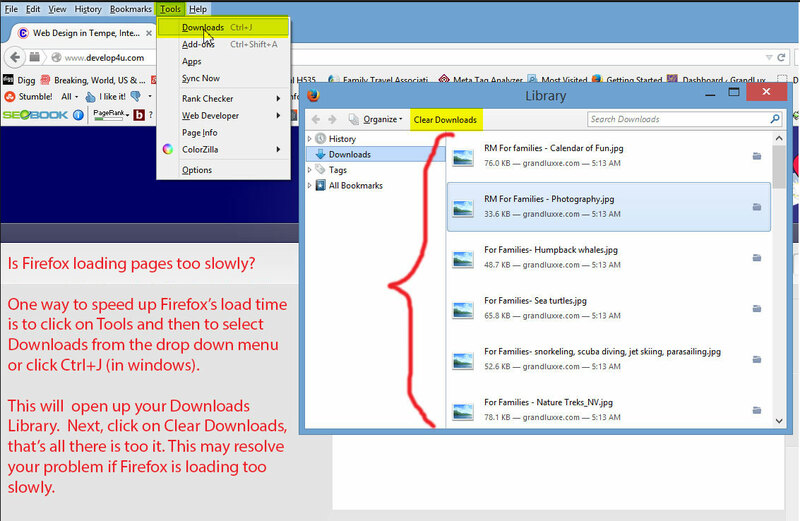 One way to speed up Firefox’s load time is to click on Tools and then to select Downloads from the drop down menu or click Ctrl+J (in windows). This will open up your Downloads Library. Next, click on Clear Downloads, that’ all there is too it. This may resolve your problem if Firefox is loading too slowly. If this does not work, another fix for slow loading web pages is to reset Firefox. This feature can fix many issues by restoring Firefox to its factory default state while saving your essential information. At the top of the Firefox window, click the Firefox button, go over to the Help sub-menu and select Troubleshooting Information. Click the Reset Firefox button in the upper-right corner of the Troubleshooting Information page. To continue, click Reset Firefox in the confirmation window that opens. Firefox will close and be reset. When it’s done, a window will list the information that was imported. Click Finish and Firefox will open. To inquire about our web design, video editing, internet marketing or social media management services for you or your business, call us at (480) 968-5096 or email us at dhannes@develop4u.com. Creative Developments is an all-purpose website development company located in Tempe, AZ, servicing Phoenix, Scottsdale, Paradise Valley, Mesa, Chandler, Glendale, Gilbert, the entire valley, Arizona and beyond.